JFR stands for Just For Retailers. 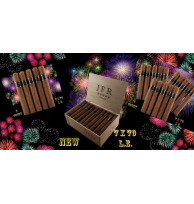 Made by Tobacalera Tropical the JFR is shrouded in mystery. It's a great value, woody notes and spice are the core flavors of this medium bodied cigar. Constructed of Nicaraguan tobacco and made in Honduras the non-figurado shapes have a pig tail at the head.